Update – the “secret” project has been unveiled. Please have a look. I can’t get into the specifics of the project, but it involves cookies, so already you know it’s going to be fun. As for the cookie selection, well, that was easy. Ever since I baked my grandmother’s applesauce cookies, I have been wondering what it would be like to add chocolate chips to the original recipe. I know, applesauce and chocolate chips don’t necessarily sound as if they go hand-in-hand, but the applesauce is really just a way to reduce the amount of sugar in the recipe while making the cookies extra soft. I said it before and I’ll say it again, this cookie is like a muffin top and I don’t know about you, but I love the top of a muffin, especially filled with chocolate chips! While we wait a few more days (I think) for the special project to be completed by some VERY (hint) talented people. 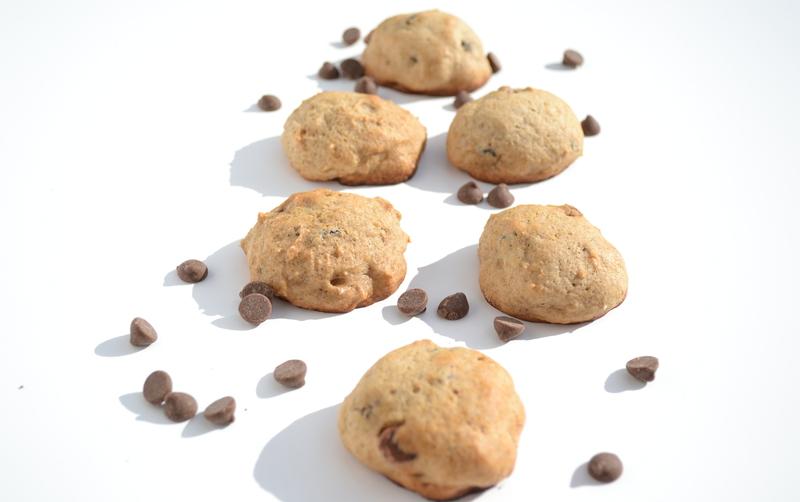 Let’s enjoy Version 2.0 of the Applesauce cookie…Chocolate Chip & Raisin Muffin Top Cookies. Cream shortening and sugar, then add applesauce, blending in. Sift flour with baking soda, salt and cinnamon. Add sifted ingredients to applesauce mixture and stir until smooth. Add chocolate chips, raisins and nuts and stir until combined. 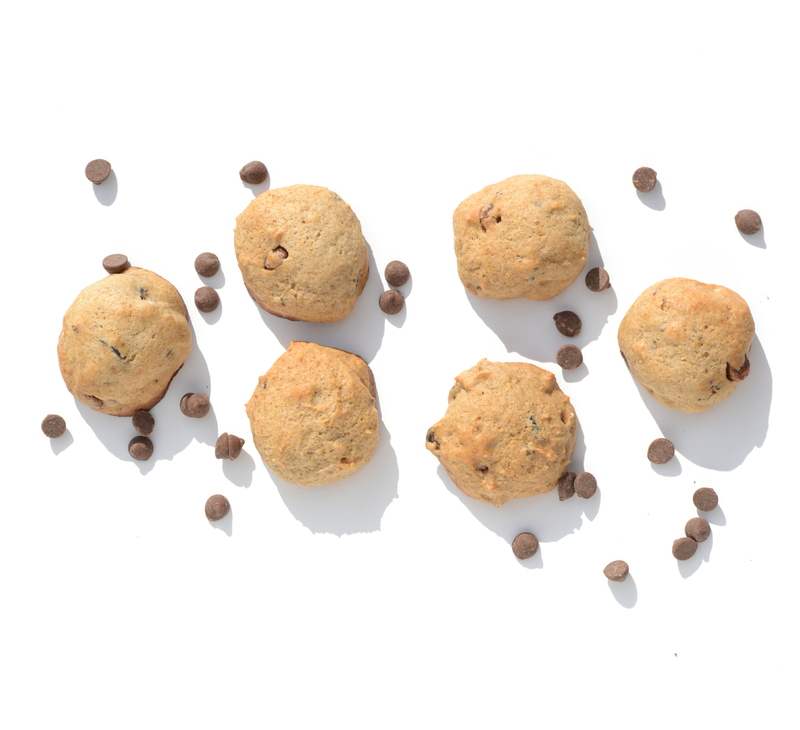 Drop by teaspoonfuls onto greased baking sheet, spacing the cookies 2 to 3 inches apart. Bake about 12 minutes or until lightly browned. Those look great, and I definitely agree with the addition of chocolate chips! And raisins! And walnuts! I always add the three of them to chocolate chip cookies, they add such a fantastic flavour. I’ve tried this recipe before (when you posted it a little while ago), but I’m going to give it a shot again with the tasty additions. Good luck with the project, can’t wait to hear more about it! Adding applesauce is a great way to reduce fat and sugar in baked goods – your grandmother knew her stuff! If it leaves a little wiggle room to be able to add some chocolate chips, then I’m in favor. I made vegan cookies once and used applesauce for those and they came out great. These look wonderful! I want to make these with white chocolate chips and dried strawberries. Yes, yes I do! Wow, those look scrumptious! Since my husband is a chocolate chip guy & I’m the fruit lover – this will satisfy both of us 😉 I bet I could add one of these raisins, blueberries or cranberries too, since they’re like a muffin top, right? Nom! Applesauce and chocolate chips sounds yummy to me. I did a pumpkin cookie with chocolate and butterscotch chips once… sounds a little off, but sometimes the “off” sounding things taste the best together. Love the overhead shot you did here with the scattered chocolate chips and I clicked back to the original post on these cookies and love that you did an overhead shot there too…with stacked apples! Subscribe me and let's eat together!